This past weekend, I needed to make something to bring to a birthday party for a good friend of mine. Since Saturday was packed full of fun activities (including 7.5 miles of running, a tour of the Roush Residence hosted by Sac Mod, and a “wine-by” of Raley’s Grape Escape), I didn’t have a big block of time to spend on the dish. Still, I wanted to bring something that looked inviting and would stand out on a potluck table. Something that would look and taste like I spent more time than I did ;), and something light that would pair well with the hot weather. So, I was looking on the Nugget Market website for some sort of direction, and this recipe emerged. Thank you, Nugget!! Of course, I never follow a recipe exactly, so I changed up a few things. Also, it’s not completely Paleo since there is cheese in the dish, but cheese is my little cheat. When you are prepping the avocados, squeeze some lime juice over them after you slice them to prevent them from browning. To prepare the salad, pretend you are making a lasagna or moussaka. You will have enough ingredients to make two layers. Layer the bottom of a 9×13 in. baking dish with both kinds of tomatoes and one of the sliced avocados, then drizzle with a tiny bit of olive oil over the layer. Add half of the cilantro over that, followed by half of the cheese crumbles. Then sprinkle half of the cumin and then crack some pepper over that. You won’t need salt because the cheese will be salty enough to season the salad. Repeat the process to form the top layer. You can follow Nugget Market on twitter here and like them on Facebook here. This entry was posted on June 4, 2012 by cavegrrl. 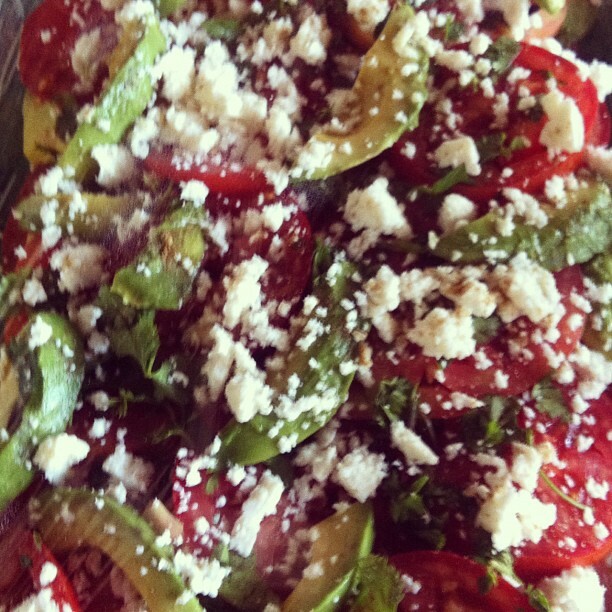 It was filed under Recipes and was tagged with avocados, heirloom tomatoes, primal, summer.